At the San Jose Technical High School: Insular Foundation officers and Insular Life agents with San Jose Municipal Mayor and his Sangguniang Bayan with San Jose Technical High School Principal and student recipients pose in front of the disaster-resilient school building after the blessing. Ribbon Cutting Ceremony at the San Jose Central Elementary School. In photo from left are San Jose Central Elementary School Principal Dr. Raquel Perfas, Insular Foundation Administrator Ana Maria R. Soriano (back), Insular Foundation Vice-Chair, Mona Lisa B. Dela Cruz, San Jose Municipal Mayor Clarence Dato, Insular Foundation Trustee Ramon M. Cabrera, and Philippine Business for Social Progress Program Manager for Education Riza Verano. Insular Foundation continues its advocacy of improving the quality of education in the country as it inaugurates two one-storey disaster resilient school buildings with three classrooms each for the students of San Jose Central School and San Jose Technical High School in San Jose, Northern Samar. The structure is the first disaster-resilient classroom building to be built in one of the poorest municipalities in the province of Northern Samar. Leading the turnover was Insular Life President and COO and Insular Foundation Vice-Chair Mona Lisa B. de la Cruz, together with Foundation Trustee Ramon M. Cabrera, and Foundation Administrator Ana Maria R. Soriano. Also present were Guest of honor San Jose Mayor Clarence Dato, local city government officials, the school principals of San Jose Central Elementary School Dr. Raquel G. Perfas, and San Jose Technical High School Celedonio Tafalla, as well as Philippine Business for Social Progress (PBSP) Program Manager for Education Riza Horcasitas-Verano. 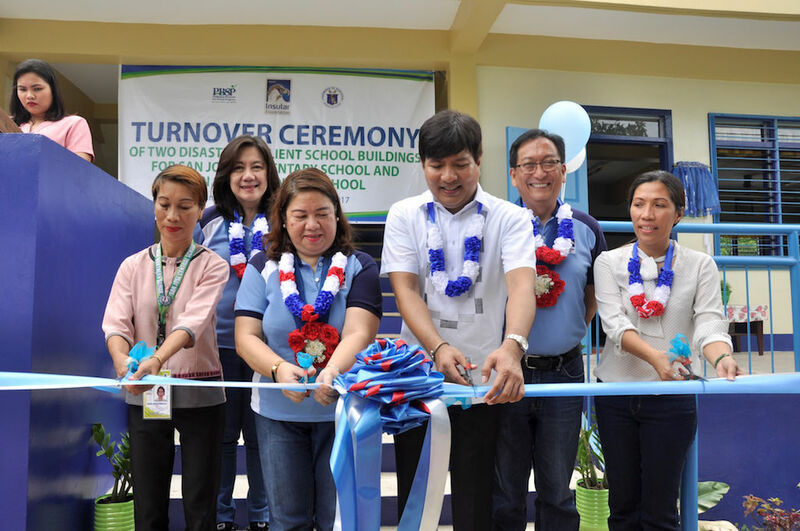 The school building project is a commitment of Insular Foundation to help bring back the school operation to normalcy after the destruction of Typhoon Nona in the year 2015. Insular Foundation collaborated with PBSP. “Insular Life Foundation is not just responding to the government’s call to support its adopt a school act of 1998. This is part of our advocacy in improving the quality of education toward making the Filipinos self-reliant and better citizens,” said De la Cruz. “It is our hope that these two buildings will inspire our youth to espouse a love for education and the life changing experiences it affords,” added De La Cruz. Kyri M. Cuna, a grade 2 pupil of said school in his acceptance speech, said the new building would inspire him to strive more so that he would be able to fulfill his dream to become a professional someday. Cuna said he was very thankful especially to the donor for the beautiful building that is very conducive to learning. For Grade 12student Jonathan Endaya, the new school building means they would no longer hold classes under the mango tree nor spend hours waiting and looking for a vacant classroom. As a promise to Insular Foundation, they will take care of the school building, and perform better in school. Mayor Dato in his acceptance message expressed his sincerest gratitude to Insular Foundation for bringing the educational help to his town. He said the assistance is very much needed due to the rising enrollment rate, especially in San Jose Technical High School because of the K-12 program. Insular Foundation is the corporate social responsibility arm of the Insular Life Assurance Company, the first and the largest Filipino insurance company in the country.